Impressia Digital Multi-Media Print Systems are the affordable way to go digital and meet the demand for fast full color letterhead, cards, envelopes, forms, brochures, mailers, labels, banners and more. 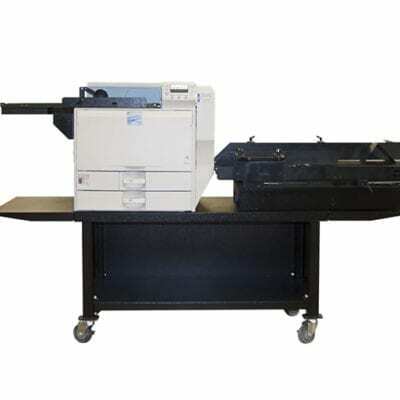 This system is a high quality color envelope printer solution. The complete turn-key solutions allow you to print on a wider variety of media and sheet sizes, so you can produce more in-house, and on-demand. The system is powered by the included iQueue Prepress Workflow that makes it handle complex digital files, make critical color adjustments, apply screening, imposition and more. The Impressia system prints on a variety of stocks including: Uncoated, coated, NCR multi-part forms, card stocks, textured stocks, label stocks and envelopes (Bar-4, Monarch, standard #10, window** and large color envelope printer solution). It offers multiple feed options including the new, patented Enterprise High Speed Feeder, two standard feed trays and an optional large capacity feed tray. Key FeaturesBest digital color envelope printer in the industry. Lowest cost per print in the industry. Prints on a wider variety of media and sheet sizes. Higher print speeds (up to 78 full color #10 envelopes per minute*). Higher resolution (up to 2400). Output is 100% waterproof.